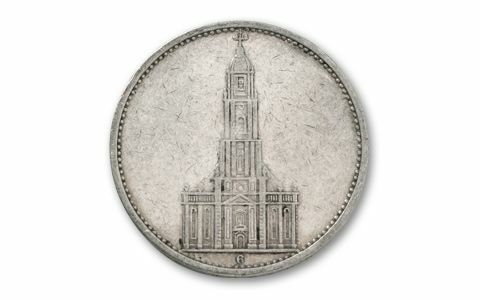 Initially, this 90% silver coin was intended to commemorate the 200th anniversary of the Potsdam Garrison Church. Instead, Hitler turned it into a first anniversary celebration of the Nazi rule. 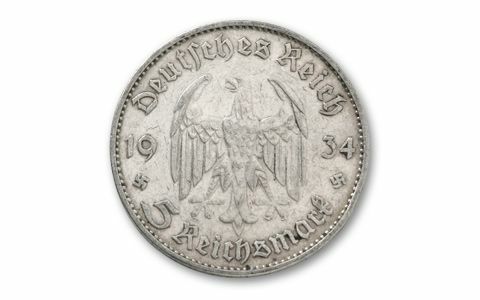 The reverse of the coin features a German Eagle and a pair of Swastikas. 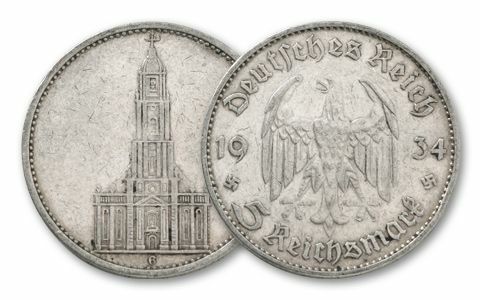 This is the largest denomination silver coin struck by the Third Reich. When the Allies defeated the Germans in 1945, anything bearing Nazi symbols was destroyed, adding to the scarcity of these coins. Each is in Very Fine condition. Date is our choice.